House Finches eat many kinds of seeds and fruits. 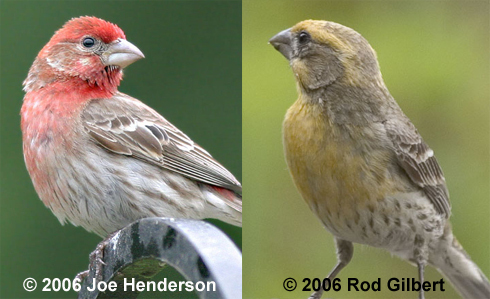 A careful look at male House Finches at a feeder shows that, while most males show red feathering, some are decidedly more orange - and some even yellow. House Finches acquire their coloration from pigments known as carotenoids in the foods they eat. Check out this video of a yellow House Finch on a feeder. Support comes from Sasquatch Books, announcing The Breath of a Whale, stories of nature's remarkable creatures of the deep, from the author of The Hidden Lives of Owls. Get BirdNote as a podcast. Sign up now!